If you are like me, when you first heard of a green smoothie, you probably thought “What in the world is that?” I thought they were smoothies flavored after something green like pistachios or limes. Nope! Green smoothies are a great and delicious way to get some veggies and fruit into your diet. It’s a mixture of liquid (like milk or water), something green (spinach, lettuce, cucumbers, etc. ), and a fruit. That’s it! Just put it all in the blender and mix it up. I like to mix the liquid and the green first. Then, I simply add one fruit at a time. I did like this smoothie I also recommend using frozen fruit. This way you don’t have to worry about adding too much ice and making it watery. 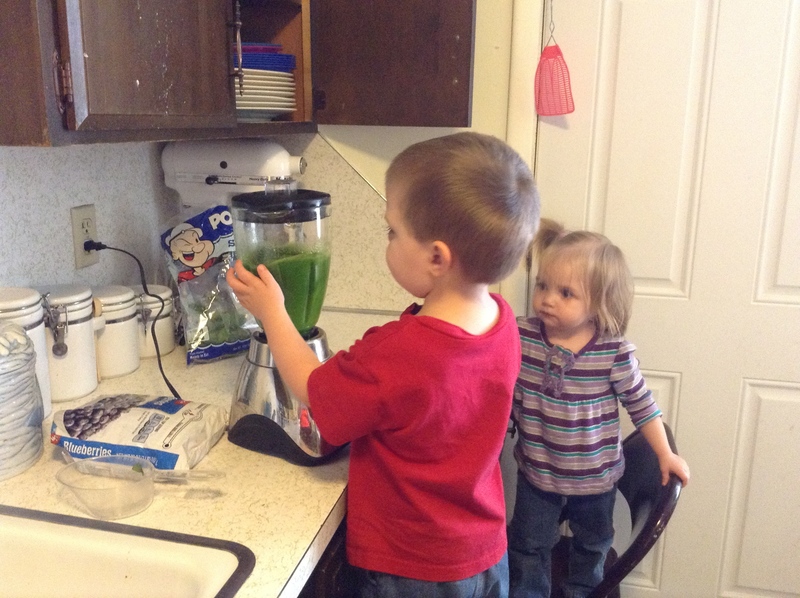 What I have loved the most about green smoothies is how much fun it has been involving the kids. My kids first got involved when they saw me drinking one. (What kid doesn’t want what their parent is having?) Both of my kids, including picky little AJ, wanted some more after I gave them a taste. Since then, it’s become an almost daily tradition where they get to help mom. PJ constantly wants to help me in the kitchen. Making smoothies is something he and AJ have been able to help me with. We pull up a chair to the kitchen counter, and I find little things he can do. For example, I can measure out the ingredients, and he can then “help” me put it in the blender. He also loves pushing the buttons (under my direction and supervision). We even found a way to include AJ. If the smoothie calls for a banana, I simply break it in half, lift her up to the blender, and she can put her half in. 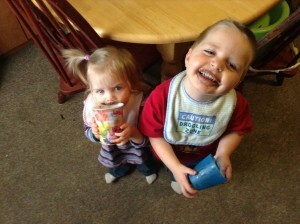 The best thing about making these smoothies is it is teaching good eating habits to my kids. Instead of candy or cookies, they are getting some fruits, veggies, and water. And what mom doesn’t love seeing that!